Banjo Patterson might have written a bush ballad about a guy called Clancy, a bloke named Harrison, and a lad who became a man but it took almost a century for director George Miller (2) and producer Geoff Burrowes to transform it into a wide screen, high country melodrama that still ranks as one of the most successful Australian movies of all time. In doing so they added a whole stable of new characters including a girl whose mother was none other than Matilda and to this day Sigrid Thornton is inextricably linked with her role as the radiant Jessica Harrison. 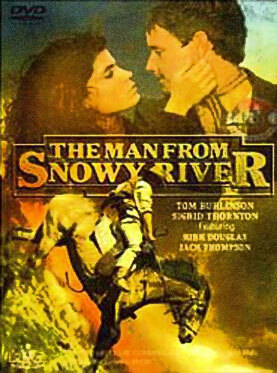 She and her co-star Tom Burlinson make The Man From Snowy River something more than just a Mills and Boon saga, rising above the sometimes banal dialogue to inject life and love into this epic Aussie adventure. In his first film role, Burlinson rides into film legend as the young mountain lad Jim Craig who must prove himself worthy of the rugged landscape and of Jessica’s hand in marriage in the eyes of her father, played by Hollywood veteran Kirk Douglas (who also doubles up as his long lost brother, the peg-legged hermit Spur). And he does so in majestic style when he single-handedly rounds up the wild brumbies led astray by the first colt from old regret under the suitably impressed eye of Clancy (Jack Thompson). The film was released in 1982 and became the most successful feature in Australian box-office history until E.T. phoned home and knocked it off its lofty peak that same year. Audiences connected with the heroic male journey, the coming of age story and the unleased romance at its core – the taming of another feisty creature with a love that defied the boundaries of class. Now, over thirty years on, the DVD release still brings a tear to the eye and a jump-start to the heart. With its spectacular setting around the town of Mansfield, Victoria and the dazzling horse riding through it, The Man remains the last word for many in defining a national identity. For lovers of Drize-a-Bones and dirty moleskins, this one is an absolute must.